Do you want to win cash, prizes and vacations but don’t want to buy a lottery ticket or 4D number? 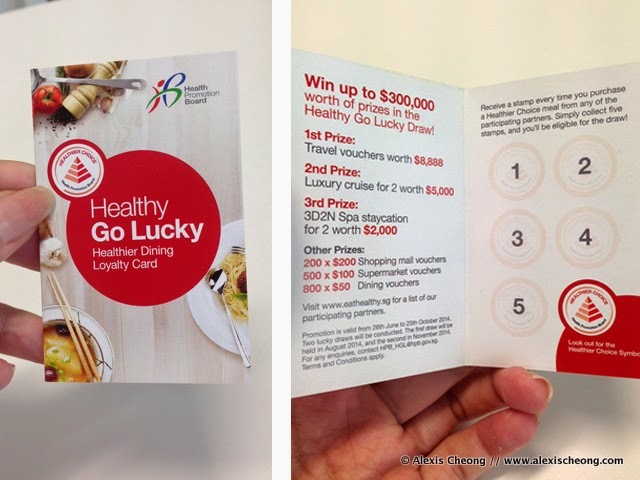 Now you can do so, by taking part in the newly launched Healthy Go Lucky draw that is in line with Health Promotion Board’s Healthier Dining Programme. From now to end October, you can win travel vouchers worth $8,888, or a luxury cruise, or even a stay-cation, plus many more vouchers! I think it’s great to be able to win so many great prizes for a lucky draw, just for dining out. Imagine going on a luxury cruise – I’ve never been on one and would love to experience it. Here are 5 simple steps to take part. 1. Get a Healthy Go Lucky card from any of the participating outlets. Click on this link to find out where you can get the cards. 2. Order a Healthier Choice dish – look out for the stickers in the menu. There is no limit to the number of chops you can get at a time, so go with friends who also make Healthier Choices, and get their chops on your card (if your friends are nice enough of course). 3. Get the card stamped at the cashier according to how many dishes you’ve ordered after each restaurant visit. You get a stamp with each healthier dish ordered. Once you have collected 5 stamps, fill in your personal details at the back of the card. 4. Drop it into the box! 5. Repeat this process as much as you can so you can increase more chances of winning. Get your next card when you are ordering more healthy dishes, and drop it in! The first draw will be held in August 2014 while the second will be held in November 2014, so stay tuned, and remember to participate as much as possible. Good luck!